I was not compensated by any of the companies mentioned in this article. All opinions are mine alone and are based on my experience with the products and/or services listed below. The purpose of this article is to help others who may be in a similar situation and I realize that different people require different methods of studying and learning. Please note that this article was originally written in 2014 and some specific details may be outdated. However, the general principles still apply. In 2011 I enrolled in my first year of law school. At the time, I had heard a few things about having to take the bar exam after graduating and before getting licensed as an attorney, but I didn’t quite understand the magnitude at that point. After making it through my first year of law school, I started to look into the bar exam process a little bit more. That is when I really started getting a little bit nervous. At that point, I still had a couple of years to go, but that didn’t stop me from getting a little bit anxious about it. I also started to hear horror stories about how difficult it is. People loved to tell me that during the two or three months between graduation and taking the bar exam, I should not plan on seeing my family or working at all. That was a thought that really concerned me because being married with two children (at that time) means that not working was simply not an option. I also was not crazy about the thought of not seeing them very much for two or three months. I started to really research options for bar exam preparation at the end of my 2L year. Almost every option I found was going to put me back a couple thousand dollars or more and would make self-study very difficult. During the Summer after my 2L year, I saw an ad for a company called BarMax that cost significantly less at that time than any of the other bar review courses that I had researched. The cost was the first thing that attracted me to BarMax. Another great thing is that it is I-Pad based and allows for personalized home study. At first, I thought that it was too good to be true and that it probably wouldn’t have enough material to prepare me sufficiently for the bar exam. However, after doing some research I decided that the cost and the ability to study whenever and where ever I wanted was enough to justify the risk. One thing that I really liked about it was that it claimed to offer a streamlined approach to study. Also, it has outlines that focus on topics and rules that are most likely to show up on the bar exam. As an added perk, I got a great deal on one of their I-Pad/BarMax bundles so I not only got the program for less than other options, but I got an I-Pad for a reduced price as well. I purchased the I-Pad/BarMax bundle in November of 2013 (about eight months before I was going to take the bar exam). While I didn’t start studying intensively until June, it was nice to have all of the materials at my fingertips which allowed me to study on my way to work every day. BarMax comes with a recommended calendar for study, but I mostly disregarded that because I needed to come up with my own study schedule that would fit with my work schedule. I chose to study from about 5:30 AM until 7:30 AM every day of the week before work. Then, I continued from about 7:00 PM until 11:00 every night. I was working between 30 and 40 hours per week up until the final week before the bar exam. Fortunately, I had a great employer that didn’t mind that I was taking off 1.5 weeks to finish preparing for the bar exam. As a result of my work schedule, I had to figure out the study schedule above that worked for me. I do want to mention that I did not stick to my schedule 100%. My family is very important to me, so I made sure that I had time for them both during the week and on the weekends. If I needed to skip a night of study, I did it. My wife was very understanding as well, and she understood how important it was for me to stick to my schedule. Below are some bulleted points for things I did to study. I spent pretty much the first month listening to all of the audio lectures for BarMax and filling out the outlines. Looking back, I probably would have spent less time on the audio lectures, although many of them were helpful. I also made sure to practice MBE questions EVERY DAY. I probably did about 35-50 questions a day. This helped me to get used to the form of the questions and to track my progress. BarMax includes 2500 real MBE questions from past exams. 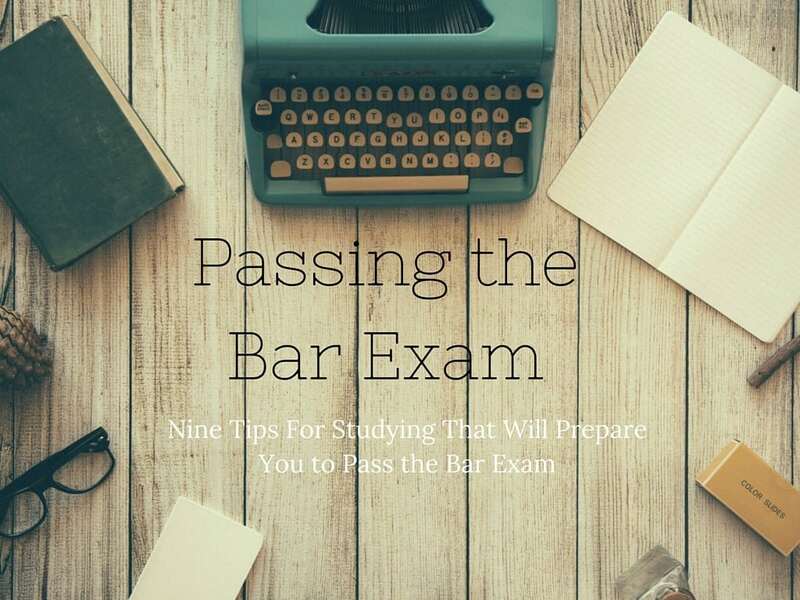 A lot of those questions seem like they were outdated, but they were still helpful and there were a lot of questions that seemed very similar to what was on the actual bar exam. I created a spreadsheet where I tracked my progress weekly to make sure that I was actually improving. This was very helpful and gave me more confidence as I got closer to the bar exam. For the last month before the exam, I studied at least once a week with a friend who was using BarMax as well. He was also going to take the bar exam at the same time as me. I cannot emphasize enough how helpful this was. It was great to talk through certain rules and to test each other on certain topics. I strongly recommend having at least one study partner who you get together with at least once or twice a week. The week before the bar exam I spent memorizing. Everyone has a different strategy for memorization. My particular method was to create my own flashcards by hand for the black letter law of each topic. I would then go through and remove those that I had down and keep memorizing until I didn’t have any flashcards left. Everyone told me that the day and night before the bar exam I should just relax. I really wanted to follow that advice, but I couldn’t bring myself to not do anything. As a result, I just did a few more MBE questions and ran through my Lean Sheets, which I will talk about in the next section. I probably could have skipped studying, but at least I could say that I did all that I possibly could. In the end, it paid off. One great thing about the low price of BarMax is that I didn’t feel bad spending money on supplemental materials. It didn’t hurt me to spend $25 or $50 for something that I thought would help out, and I did. I got an email advertising Lean Sheets about a month before the Bar Exam and I decided to check it out. Basically, lean sheets are very condensed outlines for every bar exam subject. They only cost me about $25 after a discount, so I decided it wouldn’t hurt to give it a try. I have to say that I am glad that I did! They are not the most in-depth outlines, but they contain a lot of black letter law and rules. They are also easy to supplement by adding other rules in the margins. I almost exclusively used these outlines for my memorization and study in the last two weeks before the test. The NCBE Practice MBE Test was also a helpful purchase. The cost was kind of steep at $50 for 100 actual MBE questions from prior exams. That said, I am glad that I made the purchase. It gave me a good idea of what real MBE questions would look like. I can confirm now that the questions on the OPE were similar in style and substance to the actual questions on the Bar Exam. Another good thing is that it will give you an estimated scaled score. As a result, it is a good way to gauge where one is at. Overall, I am glad that I had some extra money available from not purchasing an expensive bar review course. That is the reason that I could buy these supplemental materials. I truly believe that both purchases helped me pass the bar exam with room to spare. I want to talk a little bit about memorization. In order to do well on the bar exam, it is essential to come up with some way to memorize material. It would be great to be able to really digest, remember, and completely understand every rule that could show up on the bar exam, but that is not realistic. The can test on many issues, and you really need to know these rules so that you can make a logical analysis. I believe that there is not one right way to memorize. Everyone has to decide what works for them because what works for one person might not necessarily work for someone else. The best way for me to memorize something is to see it multiple times. I decided to take my lean sheets, and create a flash card for each rule and/or issue. I wrote these flash cards out by hand to force the rules to pass through my mind as I was writing it down. Next, I would look at the name of the rule or issue and state it out loud. If I got it right, it went into one pile, and if I got it wrong, it went into another pile. I would continue doing this until everything was in the “right” pile. Then I would go through that pile again and repeat to make sure that I still got them all right. I did this for about the last week before the bar exam, and by the time the bar exam rolled around, I was very confident that I had memorized nearly all of the black letter law that could be on the bar exam. Of course, there are always things that can be tested that are going to catch everyone off guard. Memorization is not fun, but it is a very important part of bar study, and I can’t emphasize enough how much it helps on exam day. I got up at about 6:00 AM on day 1 of the exam because my friend that I studied with and I decided that we wanted to get there early and not leave anything to chance. It wasn’t too hard to get up, because I already couldn’t sleep because of the nerves. I got to the point where I was convinced that I couldn’t pass the exam. I felt that maybe I hadn’t prepared enough and that something was going to catch me off guard. However, by the day of the exam, it was too late for those worries, so I decided I needed to just go into the test with as much confidence as possible and do the best that I could. We got to the convention center where the bar exam would be held very early, but there were already quite a few people there studying and chatting in the halls. Looking back, I probably would have left a little later and gotten there closer to when the test was going to begin. That said, getting there early at least took away the risk of not making it on time. Before the test began, we were all herded into a large room with rows of tables. I was shocked by how many people were there. To be honest, it was actually pretty intimidating. We were then told the rules for the exam and how everything would work before finally being allowed to start. There were big digital clocks around the edge of the room, so it was easy to tell how much time was left. I’m not going to lie – the test itself was challenging. I would say that on only four of the six essay questions I knew exactly what it was looking for. For those questions, I was able to do a thorough job of covering all of the issues. On one of the remaining two essays, one half of the question was pretty straightforward, but the second half had me thrown for a loop. On the last essay question, I didn’t have a clue what rule was being tested and my mind went blank. However, at that moment, I remembered what a friend who had taken the exam a year earlier told me. He told me that no matter what, write something down, even if I have to make up a rule, do it! I knew that it was testing a certain area of law, so I just tried to come up with the most coherent sounding rule possible and I analyzed the essay question according to that “made-up” rule. The interesting thing is that when I got home and looked up what rule they were testing on, my made-up rule wasn’t very far off from the actual rule! I am glad that I was able to push through and answer every question. Overall, I felt that I had done pretty well on the written portion of the exam. That said, I was still pretty worried about the MBE portion the next day. Honestly, after taking the 200 MBE questions the next day, I convinced myself that I didn’t pass. I was very confident on only about 10% of the questions, and on the rest, I felt that I could have gotten them all right or all wrong. I was able to narrow down almost every question to two answer choices, but narrowing it down to one was really difficult. All in all, I walked out thinking I had blown it. That came with worries about my future as an attorney and having to go through taking the bar exam again. Fortunately, that was not the case. One of the hardest parts of taking the bar exam was waiting two and a half months to get the results. Not a day went by during that time that I didn’t think about the results at least once. Many times I convinced myself that I had failed and nearly went into panic mode. I am fortunate to have a very supportive wife who was always there by my side. She always reminded me that even if I didn’t pass, I could do it again. My employer also assured me that I would still have a job and all of their support to take it again if I didn’t pass. When October 9th finally came, I was at work checking online every 2 minutes to see if the results were posted. When the link was updated with the July results, my heart nearly stopped in my chest. I couldn’t breathe for a few seconds and time just seemed to stop. I decided to prolong the torture by first opening up the statistical information to see what percentage of examinees had passed. The pass rate was down from the previous year, so I was a little bit worried. However, I decided that it was now or never. I opened the link, and scrolled halfway down the first page and saw my name there. The relief and euphoria that I felt were unbelievable. I checked and re-checked to confirm that it really was my name. As soon as I convinced myself that I had read the results correctly, told everyone at my work. They were all so excited for me. They even rung a huge bell that was normally reserved for when the accounting team collected a large invoice. Of course, I let my whole family know as well right away. The support I felt was awesome and the relief of having the long wait finally over was indescribable. I got my actual results the next day in the mail, and I was shocked to see that I had passed with a 331. To put that into context, the required score in Colorado was 276. I was pretty sure that I had just barely passed – so to see that I had passed by 55 points was unbelievable to me. I ended up getting almost the exact same score on the written portion as I did on the MBE. That made me feel like I had done a pretty good job of dividing up my study time. The reason I wrote this article is to help other people who are getting ready to take this huge exam. The 3-5 months of my life that this process took up were some of the most difficult of my life. If this can help anyone else get through those months, then I will be happy. Look into less expensive bar review options, such as BarMax. I am sure there are others as well, but that is what worked for me. Use some of the money you are saving by not getting an expensive bar course to purchase supplemental materials, such as Lean Sheets, and NCBE Practice MBE tests. Get a study partner and study together at least once a week if not more. This is great so that you can see what difficulties other people are having and so that you can talk through the rules. It really helps to be able to explain what you are studying to someone else out loud. Do at least 30-50 practice MBE questions per day. BarMax has 2,500 real MBE questions from past tests, and there are other resources as well where you can get real questions. Have at least a few essays graded by someone who knows what graders are looking for. With BarMax, you can submit essays to be graded by actual past graders. They then give you an estimated score. Other bar courses offer this service as well. Create a memorization plan and stick to it. Memorization can be boring and hard, but I promise that it is worth it and it will help you on exam day. Make time for your family – Don’t listen to people who say that you cannot take breaks from studying to work or to be with your family. They are the most important people and probably the reason that you are doing this in the first place. Make time for them whenever you can. If you don’t know a rule, make one up and push through. You are being tested on whether you know how to work your way through a legal issue. If you don’t get the rule exactly right, you can still get points by forming a coherent argument. Keep Calm, and Don’t Panic. Everyone is just as nervous as you. If you go into panic mode, it will affect your ability to remember what you studied. Try to stay calm and just take things one question at a time. If you have any questions about what I have written or shared, please leave a comment below and I would be happy to talk about my experience or to answer any questions that I can. Good luck to everyone getting ready to take the bar exam! « My #AllDayLook with Neutrogena products! I’m about a week out from taking the UBE and this article really provided me with some mental ease, even if only just momentarily. I feel a lot of pressure taking this test, as I have a job (dream job) on the line. Your article honestly just made me feel capable. I really appreciate you taking the time and breaking down your study habits, and also including your suggestions for memorization.